This is another great perspective piece from artist David Story. This outstanding sketch includes some interesting notes he has made in the margin. 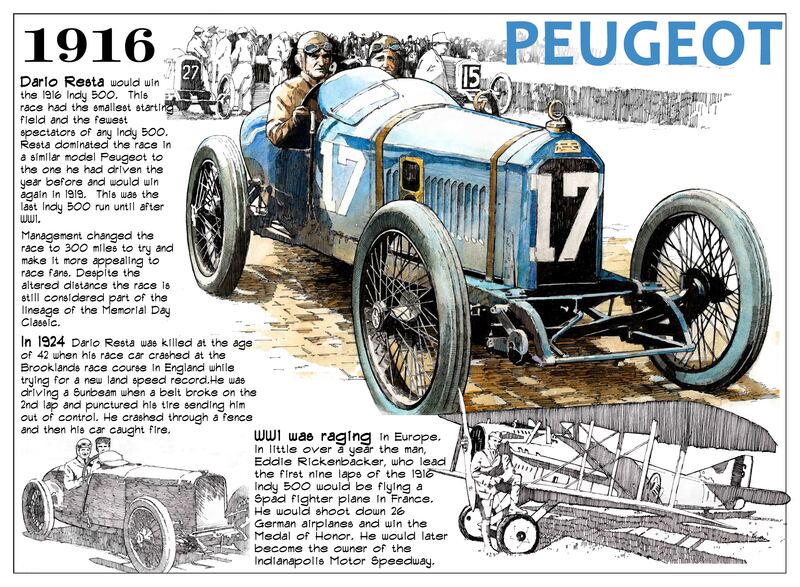 The art captures an image of 1916 Indianapolis 500 winner Dario Resta and his Peugeot racer. Actually, Resta's victory always carries an asterisk of sorts as the real distance was only 300 miles. Indianapolis Motor Speedway officials led by President Carl Fisher believed a shorter distance might hold more appeal for fans but post-race commentary did not bear this hunch out. This race marked the fourth year in a row that a European manufacturer had won the race and the second for Peugeot who also won the 1913 Indianapolis 500 with Jules Goux. Nevertheless, the big topic of conversation was the looming possibility that the United States would be drawn into the massive conflagration known as the "Great War" in Europe. With the entry of the United States into what officially became "World War I" the following April, the ever-patriotic Fisher provided the great Speedway to the Federal Government as an airfield for young pilots to master the art of the flying craft. In anticipation of the need for this decision, Fisher did something out of the ordinary in September. For the Labor Day Weekend, he staged a "one-off" event weekend called the "Harvest Classic," a set of races that was dominated by another Peugeot driver Johnny Aitken. It was Aitken's last drive at the storied track as he would succumb to the great influenza pandemic of 1918 before the track opened again for the "500" in May 1919. For the 1916 Memorial Day race Aitken was one of Resta's chief rivals, taking the pole position at 96.69 MPH in his Peugeot. For Aitken, though, the race would be a frustrating experience when he was forced out of the running with a defective valve. Despite the setback, Aitken proved to be Resta's nemesis for the rest of the season. The two would duel at other race tracks around the country as they vied for the honor of winning the American Automobile Association's (AAA) first national championship. In the end, it was Resta who prevailed earning the title by collecting the greatest number of points as determined by a system the AAA had devised. As for the Indianapolis Motor Speedway's Memorial Day, May 30 race Resta had things pretty much his way. He led 103 of the 120 laps gaining a firm grip on the contest after Maxwell driver Eddie Rickenbacker led the first nine laps. Resta's greatest years as a driver came in 1915 and 1916 when he had Peugeots - widely regarded as the best race cars in the world - at his disposal. Among several other victories, he won the Vanderbilt Cup in both those years as well as the American Grand Prize in 1915. He spent much of his time in the United States after marrying Mary Wishart, the sister of race driver Spencer Wishart who lost his life at the wheel of a race car in 1914. This terrified Mary who had a reputation for badgering her husband to quit his profession. Mary's pleas influenced his driving and his decision to retire early. However, he made a comeback in 1923 only to lose his life on the historic concrete paved high speed closed circuit track in Brooklands, England in 1924. Look for more sketches from David Story here in a special collaboration with First Super Speedway. 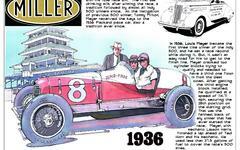 Take a look at his sketches of other Indianapolis 500 champions Ralph DePalma, Joe Dawson, Jules Goux, Rene Thomas and Ray Harroun.